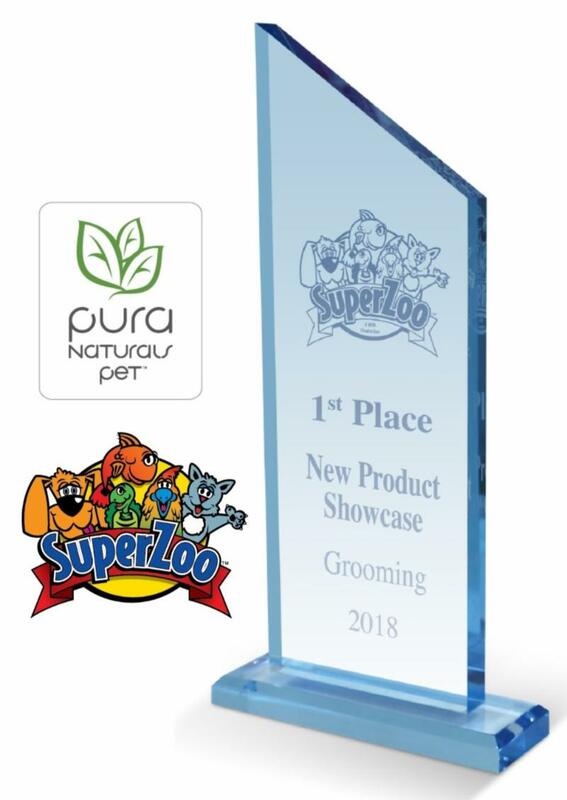 Ardsley, NY - July 9th, 2018 - Pura Naturals Pet is proud to have been named 1st Place Winner in the Grooming Category at the Superzoo New Product Showcase. Last week, more than 21,000 pet professionals and 9,500 buyers from the U.S. and around the world gathered for Superzoo in Las Vegas. The newly expanded show at Mandalay Bay boasts 2.1 million gross square feet of meeting and exhibitor space and is one of the Top 25 Fastest Growing Trade Shows. With over 1,000 exhibitors, 850+ new product launches and 9 category special showcases encompassing: Grooming, Reptile, Bird, Aquatics, Dog, Cat, Equine, Small Animal and Miscellaneous, the prestigious industry ceremony was hosted by the World Pet Association (WPA). Pura Naturals Pet entered 2018 New Products in the Grooming Category and was also prominently featured in the USA Made section. Beth Sommers President and Chief Merchandising Officer stated "It's a great honor to be recognized. We were ecstatic to win the Top Grooming Award at Superzoo since it's voted on by retailers and our peers. We've worked really hard developing our new offerings which included retailer requests such as our Flea & Tick Natural Dog Shampoo. This award is a testament that our products are resonating with the retailers and groomers. It's been a fantastic year filled with incredible growth and product recognition. This is all backed by our passionate team and our strong focus on organic pet wellness." For information on Pura Naturals Pet visit our website or call a customer service representative at (844) 698-4367. Pura Naturals Pet™ is dedicated to delivering the highest quality products using the best ingredients the Earth has to offer. Our passion is the health and happiness of our 4-legged family members. Our products are USA Made, cruelty free, non-toxic and made with food grade ingredients. This passion and philosophy flow through everything we do in putting your pet's health first.